Salt Lake City and Park City will be among the first markets in the country to get bottles of Western Standard, a new saloon-inspired beer aged in bourbon barrels from Utah’s High West Distillery, company officials announced recently. The German-style lager is being called a “modern beer with historical roots” and should be in Utah’s state-run liquor stores by mid-September, said High West founder David Perkins. The beer is 5.2 percent alcohol by volume, a level that exceeds the 4 percent ABV that is allowable in Utah grocery stores. 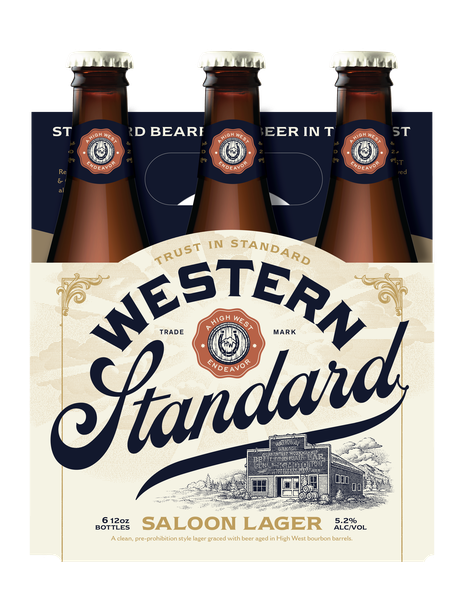 In addition to Utah, Western Standard is being rolled out in stores — and on draft — in Minneapolis and Phoenix in September. After its initial launch, the beer will be distributed nationwide in 2019. (Courtesy photo) Salt Lake City and Park City will be among the first markets in the country to get bottles of Western Standard, new saloon-inspired beer aged in bourbon barrels from Utah’s High West Distillery. Perkins, who started High West as Utah’s first modern-day spirit maker a decade ago, said he always wanted to make beer. “But we never had the money, space or equipment to do it,” he said. Two years ago, High West Distillery was purchased by Constellation Brands, one of the largest alcohol beverage companies in the country. The infusion of money as well as connections to other company leaders — including James Murray, a vice president at Ballast Point Brewing, another Constellation company — created the beer-making opportunity. While barrel-aged beers have become popular in recent years, Murray and Perkins weren’t enamored of the heavy porters and stouts on the market. “We wanted one that was lighter, lower in alcohol yet still complex," Perkins said. As he did for many of the High West whiskeys, Perkins looked to the saloons of the Old West for inspiration. Back then, German-style lagers were typically served and — because stainless steel kegs had not yet been invented — beer was transported in wood barrels. Western Standard is being produced in Ballast Point’s San Diego brewing facility using corn, rye and barley, “a riff on a whiskey mash bill,” Perkins said. The lager takes about seven weeks from start to finish and includes aging a portion of each batch for three weeks in used bourbon barrels that have been shipped from High West’s Utah distillery. The aged beer is then blended back into the batch before bottling. Perkins said he knows of no other beer like it on the market and pointed out that even those who aren’t big beer drinkers — like his wife, Jane — are drawn to the slightly vanilla and caramel flavors created by the oak-barrel aging.